Wood turtles have brown carapaces (shells) with distinct, ornately marked scutes (segments). Their underside and legs are flecked with yellow, red or orange coloration. They are sexually dimorphic—males have longer tails and claws than the females. The largest individuals can reach 9 inches in length. 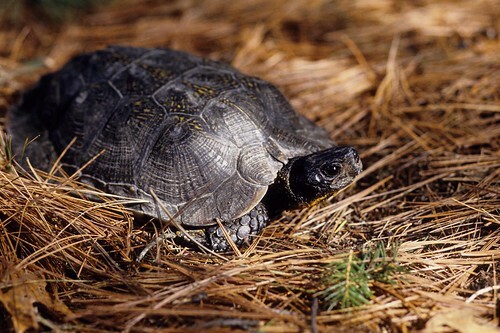 Wood turtles are found in North America. 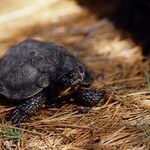 The wood turtle is considered vulnerable. Per its name, this species spends the majority of its time in the shadow of trees. 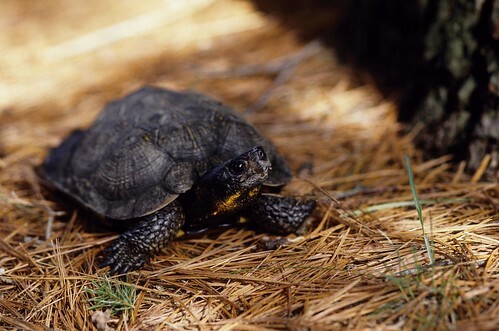 But as a semi-aquatic creature, the wood turtle is reliant on streams, ponds and rivers. When the sun shines, these turtles can be found basking on logs. 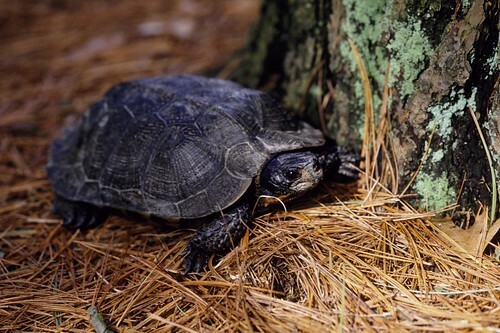 Omnivorous creatures, wood turtles eat plants, animals, insects and carrion. Their eggs fall prey to forest foragers. As many as 18 soft eggs are deposited in exposed, sandy riverbanks. After six weeks of incubation, offspring emerge and dive in. These are slow-developing creatures. Sexual maturity comes at about 20 years. 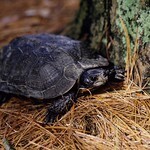 Wood turtles are primarily solitary. When forced to share a space, these turtles create a hierarchy system. Among turtles, this species is considered intelligent. Wood turtles are adept at escape and climbing. 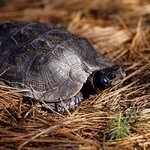 In one study using mazes, a scientist determined that wood turtles have the learning capacity of rats. Wood turtles are crafty hunters. They will stomp the ground (with feet or shell), which creates vibrations that prompts works to wiggle to the surface, where they're gobbled up.